The days have been clear, warm and beautiful. We are very lucky to live in a place that has 75 degree weather 365 days out of the year (most of the time.) What else would make these gorgeous days even more rich and heavenly than macarons! I don't know about you but I just melt with the pure enjoyment of these delicious french cookies. The crunchy, chewy and sweetness makes them nearly flawless and completely irresistible. Being a 4th timer making macarons I decided not to venture too far out of the norm, for fear of lack of success. I've read and read about all these lovely flavored macarons...rose, coffee, green tea, jasmine pistachio cherry, coconut, chocolate, blueberry, the list is infinite! They all sound so lovely! 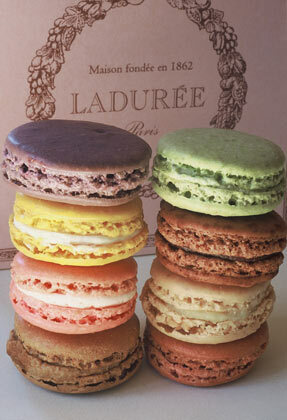 I will, someday, try some of paris' world famous Laduree macarons. Don't they look divine! I do promise my next macarons will be a bit more exciting then vanilla and chocolate, although those are classic flavors! 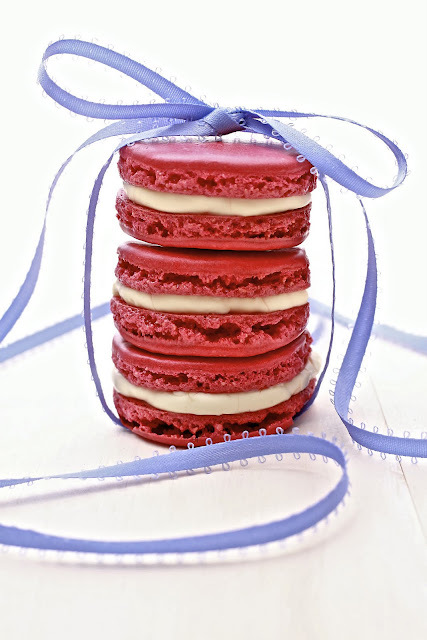 Macarons are slightly difficult to make without a scale, since most of the recipes use grams. There are a few recipes such as some of David Lebovitz that use ounces and cups. In any regard I would love to hear any of your macaron success recipes! I love to read shared stories! In a standing mixer fitted with the whisk attachment, whisk the egg white until frothy and foamy. Gradually add the sugar until a thick meringue has formed (it should have stiff peaks that form.) Be careful to not overbeat. Pour the pulverized almonds, powdered sugar and food dye in a food processor and pulse until well incorporated and the almonds are very finely ground. Add the almond mixture to the meringue and fold in quickly then fold slow and carefully until a the batter doesn't have any white streaks in it. You should not fold the batter more then 50 times. Place a piece of parchment paper on a baking sheet. Fit a pastry bag with an ateco tip (I used 806 but 807 and 809 worked the best) and fill with meringue batter. Pipe small 1.5 inch circles on a piece of parchment paper. Rap the baking sheet a few times on the counter to release air bubbles. Let the macarons sit on the counter for 45 minutes to 1 hour. Preheat oven to 280 degrees. When ready, bake for 15-20 minutes. Let cool. In a standing mixer, whip the egg whites until soft peaks form. Combine 2 tablespoons water with the sugar in a saucepan on med/low heat bring to a boil and bring syrup to 250 degrees. Slowly add the sugar to the whipped egg whites and whip until completely cooled. Add the butter tablespoon by tablespoon, slowly. The egg whites might look as though it's curdling but keep whipping and it'll come together. Add the cream cheese the same way, until smooth. Whisk in the vanilla until well incorporated. 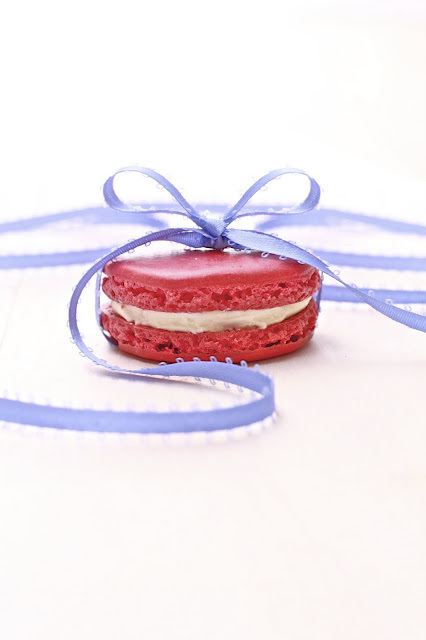 Place a generous amount of the filling onto one macaron shell and top with another shell. Repeat until all the shells are fitted. These are beautiful, love the color! How pretty!!! 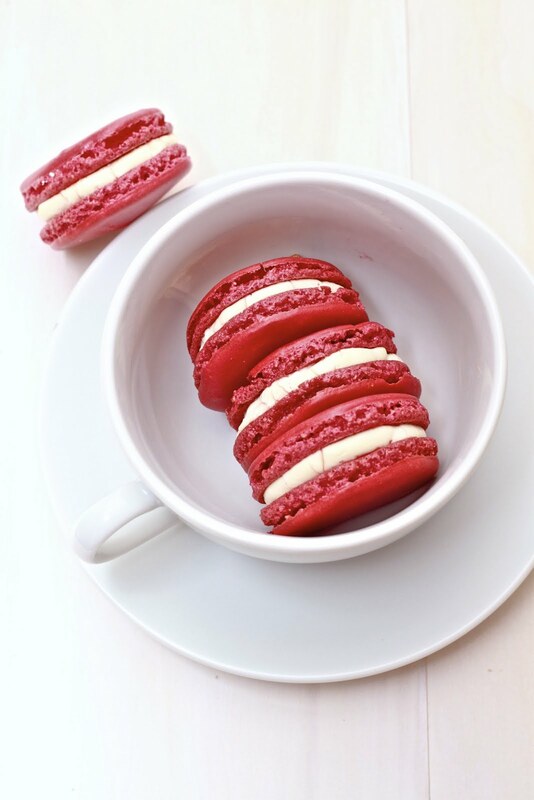 I have never made Macarons, never even heard of them before I started blogging 6 weeks ago. I am going to have to make them soon, they just look so good! I will need to get up the nerve someday to make these-but I need to taste some first! Yours look divine. Gorgeous!!! Look like your recipe turned out beautifully! !